So, where would this little Ben Kunder gem sit in the racks of your local music store? It’s almost impossible to say but I guess it’s going to land in that current catch-all, the Americana section because it features that well-known roots instrument, the synthesiser. The lasting impression of the album is of positivity; the two words of the title cropping up across various songs. It certainly ends on a positive note with a celebration of the birth of a baby in “Night Sky”. Lyrically, the album falls squarely into the introspective singer-songwriter category, but the stylings vary dramatically across the nine songs; let me explain. While “Fight for Time” “Better Days” and “Hard Line” fall in to fairly standard arrangements for this genre (okay “Hard Line” features a string section towards the end), “Jessi” has the feel of a eighties drive-time classic driven with some insanely catchy synth hooks thrown in for good measure. In common with the rest of the album, there are hints of Jackson Browne in the writing and the vocal intonation. “Lay Down”, however, is pure E Street Band with perhaps a few hints of Bob Seger in there as well. It’s over five minutes long and the combination of piano and organ from the beginning set the tone; maybe there are hints of The Band in there as well. As the song builds, no opportunity’s missed to gild this particular lily, with extra percussion from congas and tambourine, a falsetto vocal and a huge slide solo. The frantic drumming towards the end sums up the production; if it’s worth doing, it’s worth overdoing. “Come On”, which follows immediately, is a welcome chance to catch your breath before the album closes with the lovely “Night Sky”. 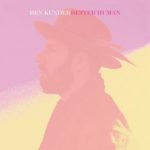 “Better Human” is an immensely uplifting album, focussing on the ways we can make things better for ourselves and each other. The fact that the sentiment is helped along by interesting and innovative arrangements lifts it well above the ordinary run of singer-songwriter albums. “Better Human” is released on Comino Music (BKBH002) on Friday September 28th.